I have always been a dog owner. Well, dog fanatic, really. My family had at least four dogs and, as soon as I started writing, I bought a dog of my own. She was a lovely, bouncing, beautiful Bernese Mountain Dog. They are as good natured as they appear, but they have all the subtlety and intelligence of a bulldozer. I remember walking along a field of heavy clay. Farmers had built up a network of ditches to allow rainwater to run away, with plank bridges thrown over to allow people across. I remember being half way over it when I realised my mistake – and danger. Seeing me crossing the plank, the dog thought, “That looks fun!” and pelted over the board. My legs knocked away from under me, and I was thrown head-first into the ditch. Fortunately, it was dry because when I fell, my shoulders were wedged into the sides and I could have drowned. I wasn’t happy, looking up, to see my Berner panting down at me, head on one side, as if wondering what on earth I was doing there. Personal injury is not the only risk with dogs. I remember two pairs of shoes she destroyed as a pup. Then there was the new window sill she ate, and the skirting board that apparently tasted delicious. Worse was to come. I was told I should have her put down. Her crime? She drew blood. Well, she was jumping up to grab a stick from my hand, and misjudged it. She looked mortified when I yelped. My next dog was a Rhodesian Ridgeback. Glorious, elegant, charming, she was (is) a perfect hound. But hounds are dreadful thieves. Since she’s tall enough to rest her chin on the table, trifles are just too tempting. I gave her the benefit of the doubt a few times, but one day she was caught red-handed on my son’s birthday scoffing cake, standing on his pile of presents. After that, I knew the culprit when a biscuit, bread roll or piece of cheese disappeared. Every time the Bernese would look at me with that happily gormless expression, smiling without guilt, and the Ridgeback would hang her head. Yes, I knew who was responsible. Sadly our old Bernese died. And I’ve learned she was a liar. Because nothing, nothing has been stolen since then, and that mournful “I told you it wasn’t me” expression on my hound’s face has been entirely justified. She gets a lot of fusses to make up. 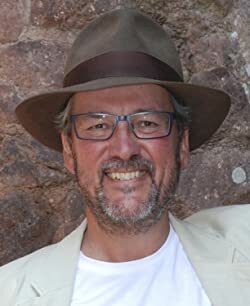 The author of 40 titles, including the Templar series, Vintener series, Jack Blackjack series and a stand-alone modern spy thriller, Mike has been Chair of the Crime Writers’ Association, founder of Medieval Murderers and helped create the Historical Writers’ Association. He has tutored at Exeter University for two years with the Royal Literary Fund and He is a keen moor walker and dog owner.